Many companies dedicated to corporate social responsibility face the challenge of giving life to their CSR strategies, guidelines and codes of conduct in a way that is meaningful to the individual employee and adds value to the bottom line. Fortunately, there are several ways to get started. 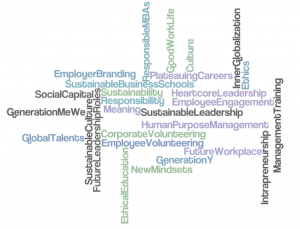 Strengthen your employer brand, increase employee motivation and revitalize your business: put corporate sustainability and responsibility into the hearts and minds of your organization. Do you need to boost your employee engagement? Or do you need inspiration on how to put your corporate sustainability and responsibility (CSR) efforts into the heart of your organization? ‘Corporate Engagement’ is about ensuring an effective implementation of your company’s CSR activities through your ‘hardwiring’ – your structures, processes, performance and measurement systems – and your ‘softwiring’ – your employee and leadership training and engagement programmes and culture. This way your CSR-ambitions become an embedded part of your company mind-set, skills and daily practices. Putting corporate responsibility, sustainability and meaning into the hearts and minds across divisions throughout the entire company ensures higher employee engagement and a strong employer brand – and may ultimately pave the way for sustainable business development and corporate social innovation. WANT TO PUT ‘CORPORATE ENGAGEMENT’ INTO PRACTICE? To learn more and do better, visit our inspirational Speaking services section, benefit from our hands-on Consulting & Training services, become a member of The Social Business Club®, or learn more from our Social Business Academy.